This is Day 5 in a series. You might want to checkout the previous day, or start at the introduction. Alright, so after finishing this show, I decided that it really required a full essay to be written about it. It was so complex and deep, and such layered story that can only be described as an epic, that it needed to be given special treatment. It is absolutely steeped in themes and meaning, so I figured that I'd try and write a thematic analysis essay, something that I haven't done since Grade 11 English class, for the book Who Has Seen the Wind?, so we'll see how this went. I've been writing it on and off for several months, with the finishing touches written in the van on the way up here, so it may seem a little disjointed at times. Please bear with me on this. Without further ado, I give you my MLA formatted essay! 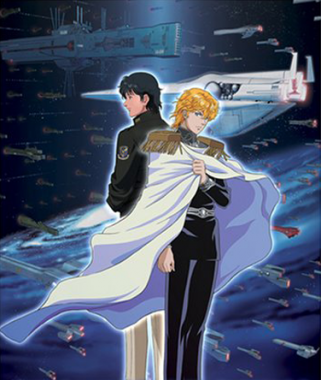 In December of 1988, a new anime called Legend of the Galactic Heroes was released on DVD. It had never been aired on television before, so technically it was an OVA (Original Video Animation) series. However, over the course of the next nine years (until March of 1997) it released 110 episodes before reaching its conclusion, more than any other OVA series before or after it. Later, it spawned some prequel movies and a side story collection of 52 episodes. For clarification, those series will not be considered in this analysis; only the main series will be looked at. As with any series that lasts for so long, LOGH has many recurring themes that run deep throughout the show. It relishes its freedom as an OVA series and takes full advantage of its direct-to-DVD releases in order to explore the themes it wants to at its own pace. Although some series such as Dragon Ball Z may be infamous for taking up entire episodes with meaningless “charge-up” sequences, LOGH is slow paced because it spends its time showing the conversations between its characters. It has a very talkative cast of characters who all tend to wax philosophical from time to time. The show is set eight centuries into the future. Humanity has expanded into the stars and two main factions have spawned: the Galactic Empire and the Free Planets Alliance. The setup of Empire vs. Rebels in space obviously draws some Star Wars parallels (many of which are warranted), but the two series are actually quite different from each other. In this series, there are two main characters: one for each side of the conflict. In the Empire, the hero is Reinheart von Lohengramm, a lowly member of the military with aspirations of greatness. In the Alliance, the hero is Yang Wen-Li, a talented young military officer with almost no ambition. As the series progresses, we watch as these men rise to power either by seizing it (as in Reinheart’s case), or by reluctantly accepting it as it is forced upon him by circumstance (as in Yang’s case). However, the show isn’t actually about the characters; it simply uses the characters to show what beliefs they are fighting for, all the way to the bitter end. Yang and Reinheart, looking cool. The show uses the setting of the future to explore the issues of today. There are several main themes that they expound on throughout the course of the series. The most obvious theme is that of Autocracy vs. Democracy. As the two main characters clash, their respective beliefs about how the universe should be ruled are contrasted. As this is a series about a galactic war, death features as a very prominent theme. Each time a battleship is destroyed, thousands of soldiers meet their end. One of the themes is somewhat surprising to see in a series set so far in the future: the importance of history. Yang is a historian by training, simply forced to join the military by circumstance. One of the less unique themes that appears is the importance of family. TV shows and movies often employ this theme, which only serves to show how relevant that theme is. The final theme that will be explored in this paper is that of loyalty. The number of characters that support the main two is simply mindboggling and their loyalty is incredible. In this future, the Galactic Empire is obviously the force representing autocracy, while the Free Planets Alliance represents democracy. Reinheart is a staunch believer in the autocratic system, as long as it is ruled correctly. At the beginning of the series, the Empire is under the control of a corrupt dynasty whose rulers sacrifice their citizens without giving anything in return. Reinheart’s goal is to take over the Empire and by doing so, to make life better for the common people. When he eventually succeeds, he rules as a just and fair Kaiser with the people’s best interests always at heart. Over the course of only three years, he manages to bring the Empire out of their recession, unify the people under one flag, and end the 300 year stalemate with the Free Planets Alliance by defeating their army, conquering the entire universe. He believes that with a ruler like himself in charge, an autocracy will always be better than a democracy. The principle example of this is the Free Planets Alliance. At the same time that Reinheart is cleaning the corruption from the Empire, the Alliance is descending further and further into their corruption. Self centered politicians are elected as leaders; under their rule, the Alliance starts to fall apart. Incompetent orders are given by politicians only looking for their own reelection, causing their military to be crushed in battle, eventually leading to their total defeat. However, Yang refuses to give up on democracy. Even if the rulers are incompetent, it’s what the people wanted. He stubbornly refuses to go against the choices of the people, ever. No matter how poorly thought out an order is, he still follows it without question. At one point, the corrupt Alliance government is overthrown by a military coup. The coup leader (who was Yang’s mentor) asks him to join their cause. Yang refuses, saying the military of a democracy should never seize power by force. They should not want power themselves; they should simply be a tool of the people. He actually defeats the coup forces and reinstates the corrupt government, because that is who the people elected. The one time that Reinheart and Yang meet in person, Reinheart says that autocracies are better than democracies because as long as the autocratic ruler is just, everyone will be treated justly. Yang responds by saying that he would rather serve a corrupt government that the people chose than a ruler who used force to take power against the will of the people, no matter how good the ruler may be. Yang then refuses to work for Reinheart, and retires from the military. 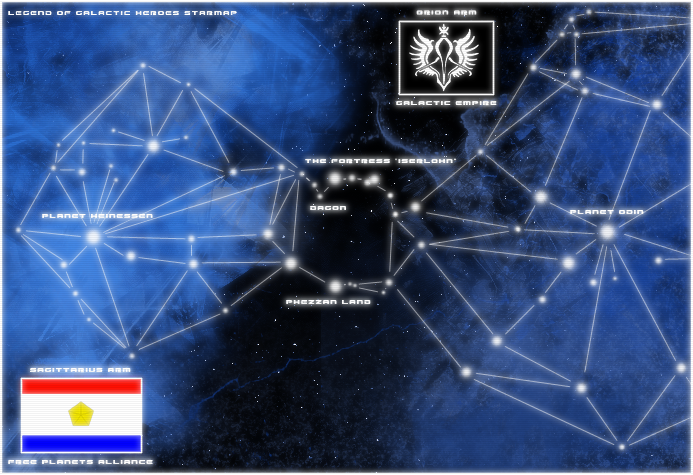 A basic map of the galaxy in the show. In a show about war, Yang’s retirement cannot last long. Sure enough, as much as he dislikes it, he is soon drawn back into the conflict. His goal never was to join the military. He only attended the military academy because he could not afford the tuition at any other school and he wanted to be educated in history. Although he has a gift for military strategy, he does not like fighting – he hates all of the death caused by war. Every time that he goes into battle, he is directly responsible for the deaths of thousands of soldiers on both sides of the conflict, and he doesn’t feel any better about killing enemy soldiers than he does about having his soldiers die. 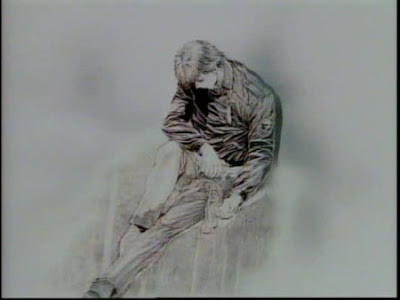 In fact, the show’s narrator at one point explains that he is hesitant to get married because he feels he has no right to have a family of his own when he has caused so much death and sadness for other families. Yang hates war, but time and again he is forced to fight. He only accepts this because he sees war as a means to an end, with the goal being peace. To drive home the point that war is not something to be desired, the show reinforces its message with images showing the brutality of war. Most of the time, the battles progress in a way that is very easy to become desensitized to; battleships shoot other battleships until one of them explodes. There is nothing very alarming about it. Every once and a while however, the camera moves inside the ship as it is exploding. The viewer is treated with images that are similar to the opening sequence of Saving Private Ryan: a man crawling around with his intestines lying next to him, calling for his mother; a man with a missing arm slowly burning to death; a man lying on the ground with half of his head missing, brain matter visible; and many, many other examples of pain and suffering. When it is simply ships being destroyed, it is easy to forget to human cost of war. The show does not want the viewer to forget. Aside from the general death of soldiers, LOGH also deals with the more personal deaths of main characters. The first major death is when Siegfried Kircheis dies protecting Reinheart. They were best friends growing up and later on Kircheis was Reinheart’s confidant and second in command. The loss of Kircheis happens at the end of the first season of the show, and for the rest of the series, it affects Reinheart. Immediately afterwards, Reinheart is distraught to the point of being is unable to function in any capacity for several days. After he has recovered somewhat, throughout the rest of the series whenever he makes a choice he always asks himself “what would Kircheis say about this?” Towards the end of the series, he even starts to see and talk with Kircheis as he gets closer and closer to meeting him in the afterlife. The other major death in the series is that of Yang himself. About three quarters of the way through the series, while on his way to the peace talks that he had been working towards his whole life, he is killed by Terraist terrorists. Their plan is to board his ship and kill him there, but Yang’s friends sacrifice themselves to let him escape to a safer part of the ship. Unfortunately, just before he can be rescued, he bumps into a terrorist wandering the halls. The terrorist shoots him in the leg before blindly running away in fear. As he bleeds out in the hallway, Yang thinks to himself that this really is what he deserves. After all of the pain that he has put others through, it is now his time to pay. One of the greatest men in the universe dies the most anticlimactic deaths possible. It is as if the show is telling us that it doesn’t matter who we are – death meets all of us equally. Neither the Empire nor the Alliance is expecting this assassination, and both sides immediately go into mourning. As the two sides retreat, we see the effect that his death has on his pupil, Julian Minci, and on his wife, Frederica. Although both of them are deeply hurt by it, they decide to continue on, following the example that Yang set in his life. They become the twin defenders of the last democratic stronghold in the universe, ensuring that the ideals that Yang died for would live on forever in his name. Death may meet us all equally, but it doesn’t have to be meaningless. If we die for a cause, it will not be in vain. One of the most interesting aspects of the show is the way that it is presented. There is an omnipotent narrator who talks about the events in the past sense, either foreshadowing or directly telling the viewer what will be happening in the next few episodes. The way it is written, it is presented almost as a series of history videos. The narrator is the great historian who has compiled all of this information and is trying to teach us about our collective history. Every event in the show has a concrete date attached to it, and rather than directly say what each character is thinking, the narrator simply states what several theories are about why the characters happened to act this way in this situation. In fact, the show that this series is most similar to is Canada: A People’s History or the Civil War documentary from PBS. On a couple of different occasions, the show takes this theme to an even deeper level by having an entire episode devoted to watching a character watch a history video about the even earlier history of humanity, from the early 21st century onwards. This “history video within a history video” technique is a little odd, but it definitely drives home the fact that history is important. As mentioned earlier, Yang never wanted to be a soldier. His whole life he wanted to be a historian and he doesn’t let the viewer forget it. Often when he is doling out sage advice to Julian he mentions that “we see from history…” He is a firm believer that we can learn from history; that humanity can better itself if we simply learn from our mistakes in the past and keep moving forward. One of his sayings was that terrorism cannot cause change; it only keeps things the same. When he is killed by terrorists in an attempt to start another war, his subordinates decide that he should not have died in vain. The make a conscious decision to learn from Yang the historian and not go to war. They refuse to lose to the terrorists, so they seek peace in Yang’s name. The primary people seeking peace are Julian and Frederica. They do this because of their relationships to Yang while he was still alive: they are his family, even if they are somewhat adopted. Julian and Yang’s relationship is one of the first introduced in the series. When we first meet them, Julian is still a young boy living in Yang’s house. He was a war orphan, taken in by Yang as part of the military orphan program. Julian looks after the hopeless bachelor Yang and Yang mentors the parentless Julian. They have a very healthy relationship, with both of them looking after the other’s needs. Yang only wants what’s best for Julian, and he treats him like he would his own son. He tells Julian time and again that he does not want him to join the military, but Julian looks up to Yang too much to follow what he says; he instead follows what he does. Yang’s relationship with Frederica is of a different kind. They first met when they were still young, back when he first made a name for himself by evacuating three million civilians from the Alliance planet El Facil by himself as a junior officer. They met again about nine years later when she had joined the military and was appointed as his adjunct. She served in that position for three years, and over the course of that time she fell in love with him, and he with her. After the defeat of the Alliance and Yang’s retirement, they were married. Sadly, their marriage was cut short by his death less than a year later. Frederica later looked back on their time together and told Julian that she had no regrets. She was glad for the time that they were able to spend together, and it is their powerful bond that enabled her to keep going, even after he had died. Reinheart also had important family ties. As explained earlier, he was very close with Kircheis growing up; so close that they were almost brothers. They did everything together, including plan to conquer the universe. When Kircheis died, it shook Reinheart to the core. But it hurt another person too: Reinheart’s older sister Annerose. Annerose and Kircheis were in love, but neither of them was able to admit it to the other. When he died to protect Reinheart, Annerose was crushed, and decided to break off contact with the rest of society (including her brother) and retreat to a cottage in the woods. This hurt Reinheart almost as much as Kircheis’ death, because she was the reason that he was living. She had been taken away from him by the Emperor at a young age, so he and Kircheis had decided to overthrow the corrupt dynasty that simply took people that they desired from families in exchange for a few measly coins. Reinheart joined the military academy, reached a position of power, and freed his sister, just as he had been trying to do for his entire life. But just after achieving his goal, she withdrew from him and refused to talk to him for three years. She did this because she thought he was too dependent on her, but it still hurt him. Sometimes, it is our family that hurts us the most, even when they are just trying to do what is best for us. Similarly to Yang and Frederica, Reinheart eventually marries his aide as well. After several years of relying on Hildegard von Mariendorf, he starts to realize just how much he needs her in his life. It takes him four years, but he eventually realizes that he is utterly dependant on her, and that is when he falls in love with her. Their marriage lasted only half a year, but during that time she bore him an heir meaning that when he died of illness, the empire did not collapse. As Reinheart died, he gave power to Hildegard, because he knew how capable she was. Some of the supporting characters have important family ties as well. Wolfgang Mittermeyer and Oskar von Reuenthal are best friends, and are Reinheart’s most powerful Admirals after Kircheis is killed. Unfortunately, towards the end of the series, Reuenthal’s honour forces him into a rebellion, which ultimately leads to his death. He has an illegitimate son that he asks Mittermeyer to take care of as his dying wish. Mittermeyer and his wife are unable to have children of their own, so it was a great blessing to them. They pour all of their heart and their soul into his child, promising to raise him as their own. They will raise him to be best friends with Reinhart’s son, the future heir to the throne, so that both children can have the best life possible. In the Alliance, a dysfunctional family is introduced in the second half of the series. Walter von Schenkopp, an Imperial deserter, was never one to settle down with one woman. He had many relationships, and Katerose von Kreutzer was the product of one. She also deserts the Empire and joins Yang’s rebel force, where her father is a commanding Admiral. She eventually confronts him about it, and says that she will never forgive him for how he abandoned her mother. He says that he doesn’t care and she better get used to it. They never really have a chance to work things out before he is killed, but when she hears that he has died, she is clearly heartbroken. She is still angry at him, but she is sad because she never had the chance to deal with him herself. Family hurts, but not nearly as much as if you don’t reconcile with them. Most of the main cast. Not all. Not even close. Yang has an incredible team of subordinates, all of whom are loyal to him to the very end, and even beyond. They rebel against the Alliance when Yang is unjustly arrested, rescuing him from being executed and forming their own faction. One of his admirals was originally sent to assassinate him, but after his plan was stopped, he unconditionally switched sides to fight for Yang, never changing sides again. After Yang was killed, Admiral Murai decided to abandon the fleet – not because he was a deserter, but because he wanted to give any real deserters the chance to leave. All of the other officers stay and see Yang’s vision of a free, democratic society through to its foundation. The subordinates of Reinheart show incredible loyalty as well. Reuenthal does rebel against Reinheart, but that is not his choice. He does consider rebelling earlier in the series, but gives up on the idea as he realizes how outclassed he is by Reinheart. Unfortunately, a Terraist plot makes it look like Reuenthal tried to kill Reinheart, so rather than appear to be an incompetent leader, he decides to take the blame and follow through with the rebellion. As he dies, his rebellion collapsing around him, he comments that he is still loyal to Reinheart, and always was. But possibly the greatest example of loyalty was that of Paul von Oberstein. He was the chief domestic affairs officer for Reinheart, and he was the one who came up with many less than ethical plans to advance Reinheart’s position. By proposing all of these despicable plans, he makes the other officers hate him. Soon, the entire population of the Empire hates him. Perhaps he was simply a bad man, but his final action speaks volumes about his character. He finds out about an attempt on Reinheart’s life, and using his misinformation network, convinces the terrorists that Reinheart is located in a different room in his house: Oberstein’s room. To make the plan even more convincing, he stays in the room, waiting for the terrorist attack, and ends up killed by their bomb in order to save the Kaiser. The narrator suggests that he intentionally proposed all of those hated plans, to draw all of the people’s hate onto himself and away from Reinheart. It was his way of showing his loyalty. Several times throughout the show, it is stated that the people do not believe in their leader’s ideals; they believe in their leader. Yang himself states this idea. They are not following democracy or autocracy, they are following a man. Legend of the Galactic Heroes is an epic in the true sense of the term. With its massive length and incredible number of characters, it is able to explore deep themes. It looks at what system of government is better, the ramifications of war and the death it causes, the importance of history, the different types of familial relationships, the loyalty of subordinates, and many others that we did not look at. The series may be set in the future, but all of these themes are relevant to our lives today. There is much that we can learn from this show if we only take the time to listen. Thank you for reading this if you did. Honestly, if you slogged through any of this, I'd be really impressed. Just as a PSA, it is Global Shinkai Day, when the works of Makoto Shinkai are celebrated (and free to watch on Crunchyroll through March 17th). This includes 5 Centimeters Per Second and Voices of a Distant Star. Go check them out!